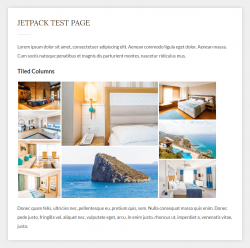 Jetpack is a very popular plugin developed by Automattic, the makers of WordPress itself. 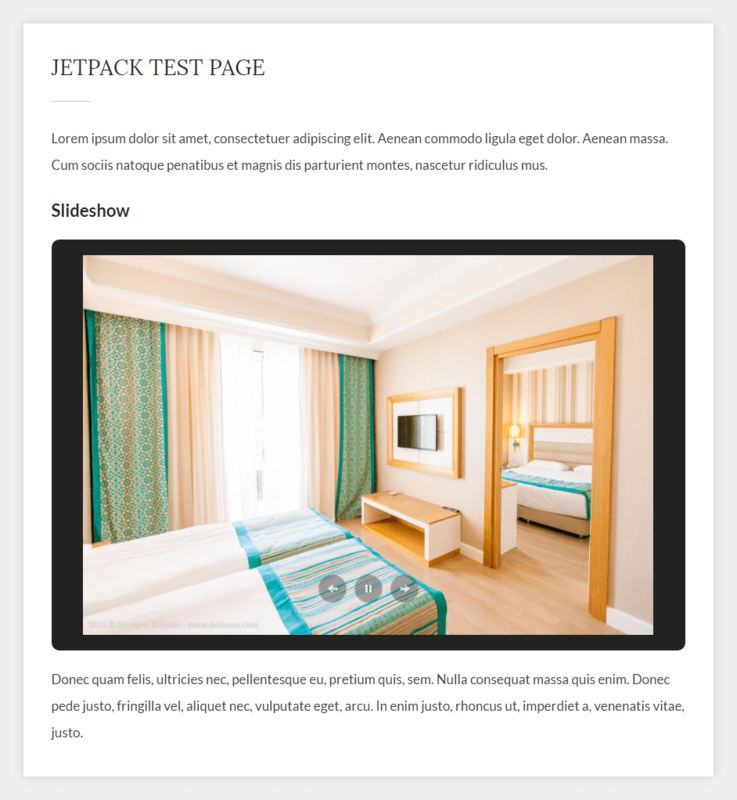 Think of Jetpack as the Swiss-army knife of WordPress plugins. This is a great plugin to have installed on any self-hosted WordPress website. To install Jetpack simply go to Dashboard > Plugins > Add New and you will most likely see it on the first page. Click the “Install Now” and wait until it is downloaded to your website. After that you can Activate the plugin. Besides activating Jetpack on your WordPress website there is an additional step before you can fully use it. You have to connect it to a WordPress.com account, as some features are going through the servers of WordPress.com (yes, even if you are self-hosted). Usually this error is caused by server security restrictions (or security plugins) that restrict access to xmlrpc.php. Please check this page for more Jetpack Troubleshooting Help. After you successfully approve and activate the plugin, Jetpack will offer you 3 pricing plans (current for: 21/09/2016). The Free Plan should be sufficient for most WordPress websites and blogs, especially for non-commercial websites. Some of the features provided by the paid plans can be achieved with other third-party plugins, both free and paid, so I recommend not rushing into upgrading to a paid plan. Check the features, check the alternatives, etc. As I mentioned earlier Jetpack is like a Swiss-Army Knife. It contains multiple modules(features) that you can enable/disable at any time. Currently these modules are conveniently grouped in 5 categories: General, Engagement, Security, Appearance, Writing. I will present only some of the modules that I think should be useful for most regular users. From the Engagement tab I usually keep just 3 modules enabled: Site Stats, Sharing and Enhanced Distribution. I tend to enable this module on most websites that I have, simply because I like seeing the stats directly in my Dashboard. Even though I also install Google Analytics on ALL my websites, the Site Stats module provides me with a handy “second opinion”. I like the Site Stats module because it displays information about your referrers as well as outbound clicks. If you have links to external URLs, you will be able to see how much traffic you are sending out. Check the screen-shot below for an example of stats you get for a real website (not this one). 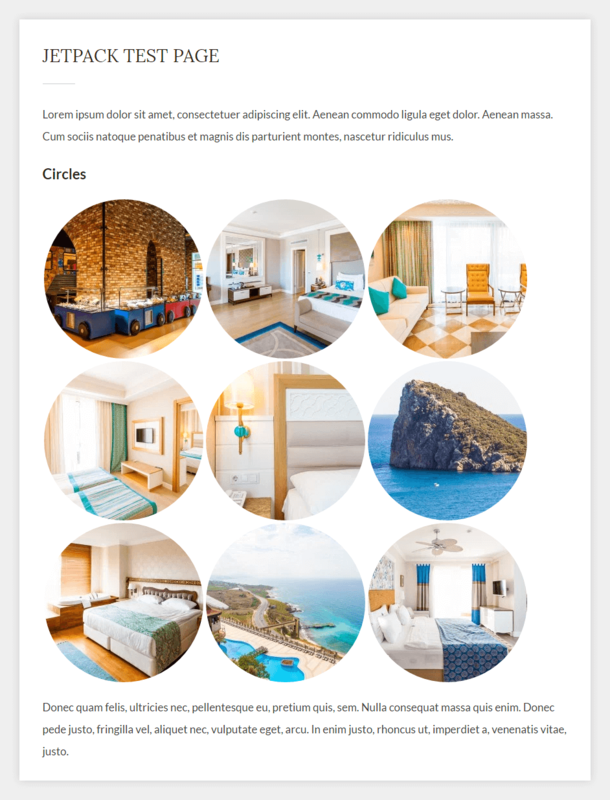 This module lets you add the usual sharing buttons at the end of your content: posts, pages, custom post types, etc. You can enable just the services that are popular among readers. A hotel website will probably want to use Facebook and Pinterest, but not Tumblr or Reddit. Currently you can use these button styles: Icon + Text, Icon Only, Text Only, Official Buttons. I guess leaving this module enabled shouldn’t hurt, though until now I haven’t seen any real benefits from it. The Security section of Jetpack reminds us that this plugin has some paid plans. This module helps to prevent Brute-Force attacks on your website. In short, a brute-force attack consists of an attacker trying many passwords in a very short amount of time hoping to eventually find the correct password. Such attacks will usually consume a lot of resources on your server and will greatly reduce the server’s performance, leading to a much slower website. Jetpack Monitor will keep tabs on your site, and alert you the moment that downtime is detected. Once activated, one of our servers will start checking your site every five minutes. If it looks like something’s gone awry, we’ll fire off an email notification to the WordPress.com account that Jetpack is connected under. You can get a similar service from vendors like Pingdom. This will cost you from $11 / month for their cheapest plan. This module in Jetpack is FREE (for now). The Writing section of Jetpack provides some modules that in my opinion have a limited applicability. Besides the Contact Form and the Spelling and Grammar modules I don’t know what percentage of users will actually NEED the other modules. How many of you use WordPress to write complex math equations in your posts? Or how many of you will actually publish posts on your blog via email? I would love for Automattic to release some stats about the usage of their Jetpack modules, would be interesting to find out. The Appearance section of Jetpack is probably the one that makes Jetpack worth using. Most of these modules can be useful to a large portion of WordPress users, no matter if you have a personal blog or a company website. 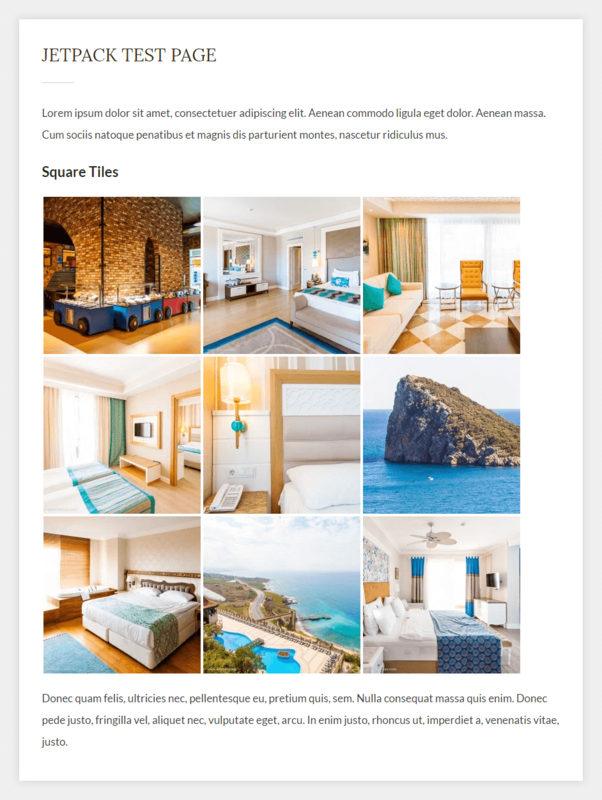 By default WordPress has very limited options to create a beautiful image gallery. In most cases you will want to use a plugin or a feature provided directly by your WordPress theme. The only options that you have when creating a standard WordPress image gallery is the number of columns in which the gallery grid should be displayed. Some themes will overwrite this and force a certain amount of columns. Now let’s take a look at the other type of galleries that this module lets us create, 5 new types in total. My personal favorite is the Square Tiles as it will always have a predictable result. The Tiled Mosaic will always be different and will depend on the amount of photos that you have, as well as their orientation: landscape or portrait. 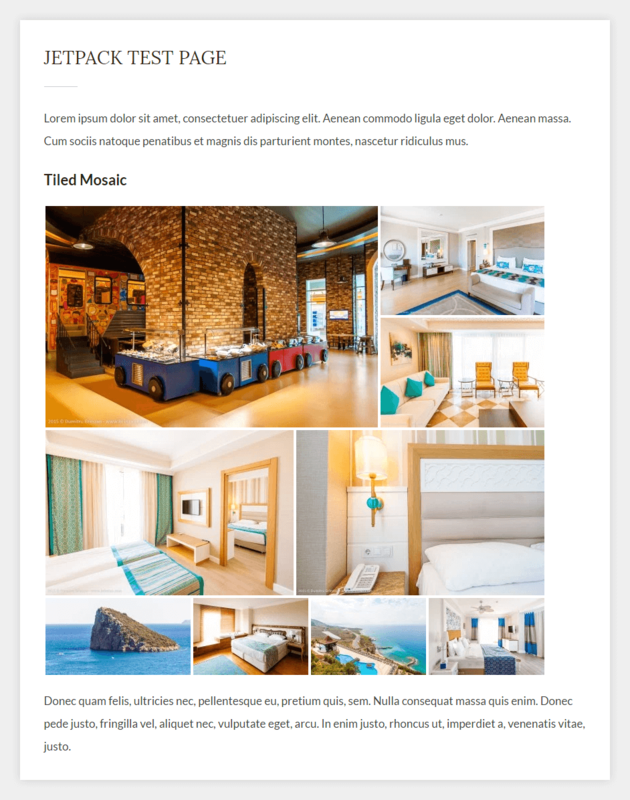 The Carousel module is basically a Lightbox-style slideshow module. After you enable it, all galleries that you create (or have already created) using the [gallery] shortcode will have this carousel enabled. When someone clicks on any of the photos in the gallery the carousel will appear in a lightbox effect which will take 100% of your screen’s width and height. As you can see, with a single module in Jetpack you can enable a bunch of useful widgets, such as the Facebook/Twitter/Google widgets. One of the best widgets is the Gallery (Jetpack) widget, which lets you create the same galleries as the Tiled Galleries module, only this time as widgets which you can conveniently place in any widgetized area (sidebar). All thumbnails are automatically resized and can link to the Carousel. Very, very convenient! And the last module that I would like to highlight is the less-known Widget Visiblity module. 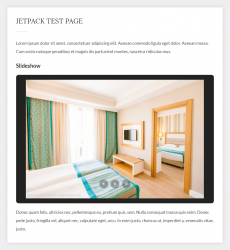 In short, it lets you display certain widgets only on specific pages of your WordPress website. It adds a new “Visibility” button near the “Save” button for ALL widgets: standard widgets, Jetpack widgets, custom widgets, etc. 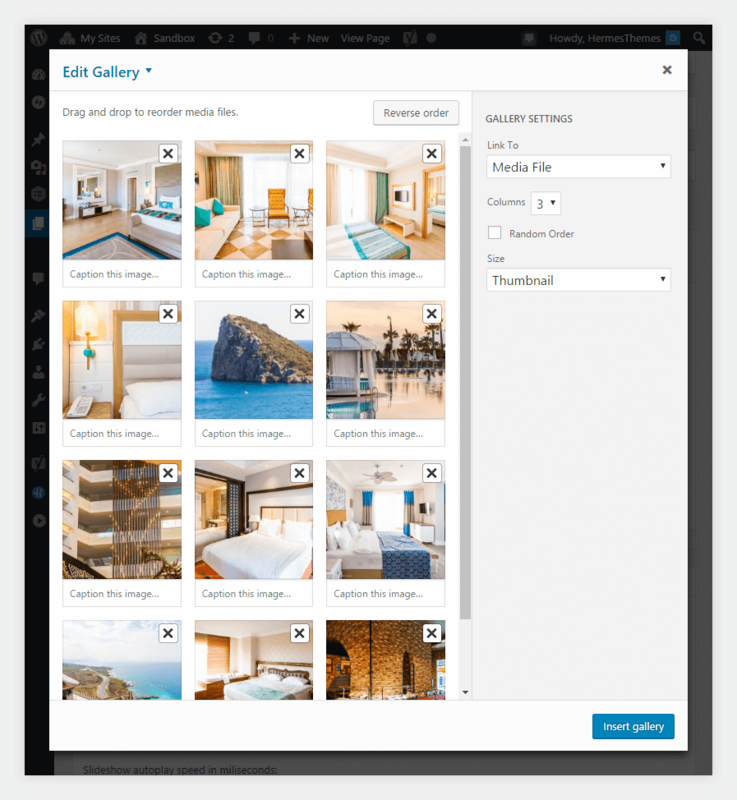 For example we can specify that the Gallery widget from above should appear ONLY on our “Junior Suite” page. Then we create another Gallery widget and set it to be displayed on the “Family Room” page, etc. This means that you no longer have to customize a theme and define separate sidebars for separate pages, or use third-party plugins for Sidebar management. Simply use this module and keep everything in one place. 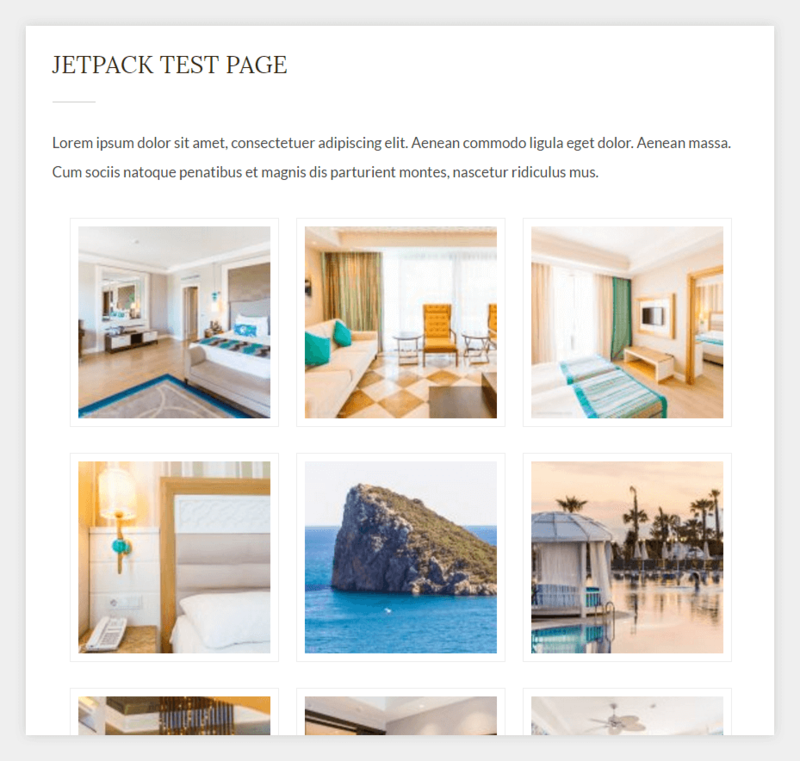 It is important to note that older versions of the Jetpack plugin were considered to have a somewhat noticeable negative impact on a website’s performance (especially on a shared hosting account), but in current versions this impact is barely noticeable. I use Jetpack on every single website that I own or maintain (including HermesThemes) and I haven’t noticed any significant performance issues from it. Simply enable just the modules that you need and use and everything will be fine. Good luck and I hope that you found this post useful!